In today’s blog, I give PT Serif and to a lesser extent PT Sans a more full review. 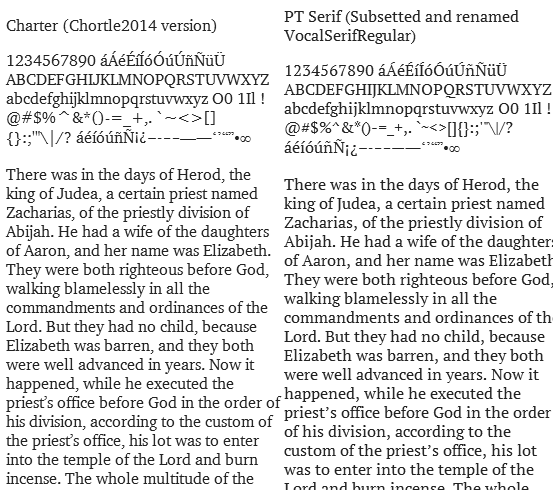 Summary: While a very good font, I feel Charter is an even better font. PT Serif and PT Sans were commissioned by the Federal Agency on Press and Mass Communications of the Russian Federation, who are also known as “Rospechat”. The fonts were designed, to quote the Wikipedia “to support all the different variations of Cyrillic script used by the minority languages of Russia”. The fonts not only have fairly extensive Latin support (ASCII, ISO-8859-1, Windows Codepage 1252, etc.) but also support a number of mathematical symbols and have, as per their design, some of the most extensive Cyrillic support for any font out there. The important thing to keep in mind is that these fonts were, first and foremost, designed to render Russian languages well; rendering Latin script was a secondary priority. Bitstream Charter, on the other hand, was designed by Matthew Carter to render English and a few other Western European languages. The version donated to the X Consortium in 1992 only supports English and the other languages “Mac Roman” supports (The languages Mac Roman supports include Italian, Spanish, Portuguese, French, German, Dutch, English, Danish, Swedish, Norwegian, and Icelandic). PT Sans and PT Serif were developed by a type foundry in California called ParaType. Not only does ParaType sell expanded versions of PT Sans and PT Serif, they also sell a version of Bitstream Charter with Russian letters (made by one very talented Vladimir Yefimov who sadly is not with us any more; the late Vladimir Yefimov also oversaw the development of PT Serif) that Matthew Carter has praised. In the first image, on the left is Charter and on the right is PT Serif. Here, we can see that Charter is more rounded looking and PT Serif is more angular. I don’t like PT Serif’s “Dagger” serif in the “3” at all (As an aside, I really feel Constantia would have looked a lot better if it used rounded or slab instead of “dagger” serifs). The descender in Charter's “y” is longer and ends more smoothly, and I prefer its slab serifs on the top over PT Serif’s angular serifs. The “J” looks a lot better in Charter — it is wider and far easier to read; I just am not a fan of this “dagger” J which sometimes pops up in serif typefaces. The reason why the “3” looks so distinct in PT Serif is so it is not confused with a letter in Cyrillic. Now, when rendered at screen resolutions using modern font hinting technologies, I will conceded that the two look similar, but I think Charter looks a little better. I was referring to the delta-hinted version of PT Serif; when using clear type rendering, PT Serif has less of a hard edge to it and is a really nice looking readable screen font. One thing to keep in mind is that Charter is a good deal lighter than PT Serif’s regular weight. While the for-pay version of PT Serif has a lighter “book” weight, it still is not quite as light as Charter. The reason Charter is so light is probably because, to quote one graphic design professional on Typophile, “Charter was designed when the print workflow was repro-negative-plate”. In other words, there was an intermediate step in the printing when Charter came out that made letters darker; Carter compensated for this by making Charter’s letters a little lighter. Ironically, since the current trend is to make web fonts a little lighter, Charter works nicely as a very modern looking serif webfont. For people who wish for a slightly heavier Charter, Charis SIL is an excellent free choice (and has a far greater Unicode and language support than the free Charter). PT Serif and Bitstream Charter are both very beautiful fonts which are available in free versions. The free version — and, indeed, the for-pay version — of PT Serif has a larger number of weights and forms, including, quite nicely, a version with a small “caption” optical size which is available both as regular and italic for free. As far as I know, PT Sans and PT Serif are the only open source fonts with variable optical sizes. While I feel PT Serif is an excellent free font, I think Charter has a slight edge when used for Western European language body text. This is why I gave Charter my best serif font prize, while giving PT Sans a honorable mention for best condensed font. I will also give both PT Sans and PT Serif a honorable mention for being the best free fonts with a “caption” optical size available. Charter was designed by an expert font designer who had over three decades of font design experience when he made it, and it shows. It is the best free serif font I have found.